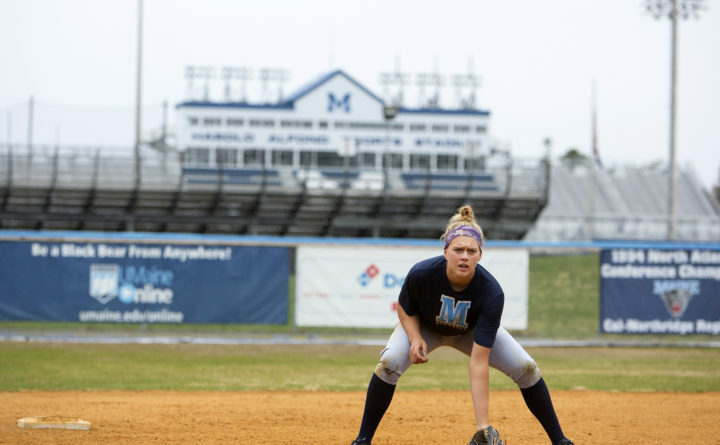 University of Maine's Alyssa Derrick waits for a ball during an April 2017 softball practice at the University of Maine in Orono. Melissa Rahrich fired a four-hit shutout on Friday afternoon, leading Stony Brook University to a 2-0 victory over the University of Maine in an elimination game at the America East softball tournament in Vestal, New York. The third-seeded Seawolves (25-21) advanced to Friday’s championship-round contest against No. 1 University at Albany (25-21). The fourth-seeded Black Bears closed out their season at 22-25. Rahrich kept UMaine in check, surrendering four singles. She struck out three and walked one. Rahrich outdueled the Black Bears’ Kyleigh O’Donnell, who held Stony Brook to five hits and two runs with two strikeouts and one walk. Laurine German, Alyssa Derrick, Maddie Decker and Kristen Niland each posted a single for UMaine. Stony Brook snapped a scoreless tie in the top of the fifth. With one out, Jourdin Hering doubled to center field and Katelyn Corr was hit by a pitch. O’Donnell then induced a fielder’s choice grounder by Ileana Torres to get the second out. That brought up Rahrich, who reached on an infield single to shortstop, loading the bases. O’Donnell then battled with Irene Rivera, who fouled off several two-strike pitches before drawing a walk that forced in the only run the Seawolves would need. UMaine threatened in the sixth with two outs when Alyssa Derrick drilled a shot to the base of the center-field fence, but settled for a single after apparently missing first base. Stony Brook argued that center fielder Corr had made the catch, but it was ruled a hit. However, Erika Leonard grounded into an inning-ending fielder’s choice. The Seawolves added a run in the sixth when Nicole McCarvell stroked a leadoff double down the left-field line, advanced on Riley Craig’s sacrifice bunt and scored on pinch-hitter Allyssa Malony’s sacrifice fly. UMaine stranded five baserunners, but none reached second base.